Relax and unwind in the seaside village of Lorne, with its Mediterranean feel, mild weather, cafes, culture, shops, boutiques and galleries. Enjoy the surf and seaside life, (home of the iconic Pier to Pub swimming event) or entertain the kids at the spectacular new Lorne sea baths, trampolines and play areas. Visit some of the area's stunning surrounds, exploring the spectacular Great Ocean Road, and the Otway National Park. Stroll along the banks of the Cumberland River or take in the view over Loutit Bay. Explore the many waterfalls behind Lorne. Visit the Sheoak and Blanket Leaf Picnic Grounds. Walks in the park will lead you to Phantom Falls, Cora-Lynn Cascades, Kalimna Falls, Henderson Falls, Erskine Falls, Sheoak Falls and don't forget romantic Teddy's Lookout! Fancy a game of golf? La Brise Marine backs onto the third hole of the Lorne Golf Club! Relax with a coffee at a sidewalk cafe, picnic under the trees on the foreshore or dine on freshly caught seafood at a local restaurant. After dinner you can take in the offerings at the quaint picture theatre. Renovated with a chic French seaside theme, this holiday house offers stylish surrounds amidst views of the sea, Lorne pier and pub from the deck, the two lounges and dining/kitchen area. With only 300 meters (5 minutes) walk to the Lorne beach and twenty minutes walk to the centre of Lorne village it is both central but removed from the hustle and bustle. Nestled into the beautiful gum trees adjoining the Lorne Golf Club, the home also showcases a rear garden with bushland views, native birds and koalas. It offers flexible eating, entertaining and relaxation areas. The front deck and back patio have outdoor dining tables and chairs to seat 8-10. Indoor dining also caters for 10 people. For your convenience we have added internet and Netflix access free of charge. One lounge offers a Smart TV and Netflix for your use as well as including DVDs and video library. The second lounge offers a flat screen digital TV and DVD. Offseason, enjoy relaxing by the cosy woodfire. Espresso machine and capsules also provided for your enjoyment. The main King sized bedroom comes complete with ensuite, desk, wardrobe and TV. The second bedroom has a Queen size bed, large wardrobe, digital TV and DVD. The third bedroom has a double bed and wardrobe. All bed and bathroom linen, bedding and towels supplied. There is also a washing machine and dryer for your convenience. The central bathroom is large and a third outdoor toilet is provided. There is extensive parking available on title including a carport and further parking. IMPORTANT: Minimum stay of 2 NIGHTS. 3 NIGHTS on LONG WEEKENDS and 4 NIGHTS EASTER. Please contact owner for prices and availabilty for these times. Activities folder provided with contact numbers for entertainment, shops, cafes and restaurants etc. Sea views, nature views, close to beautiful beach. Perfect for winding down with a good book. Enjoy the ambience. toilet, Third toilet and sink. 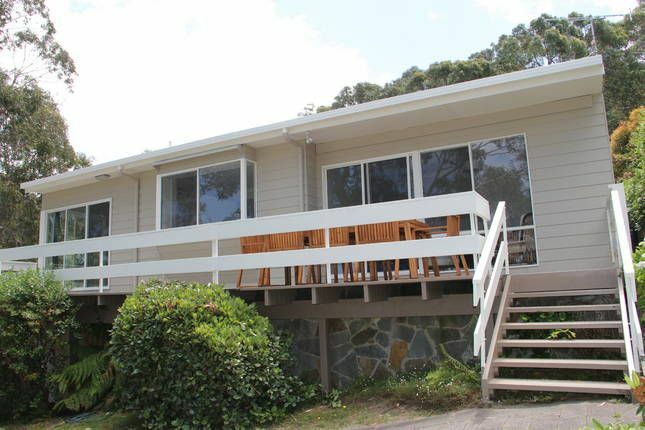 Our property is 300 meters from the Lorne beach/ocean. Beautiful view of Lorne's Louttit Bay beach including the Lorne pier and Pacific Hotel. Our property adjoins the Lorne Golf Course. Views from the back garden on to the Lorne Golf Club's third hole. All bed linen provided including pillows and pillow slips - doona and doona covers. Extra blankets. Washing powder provided. Line drying available. Off-street driveway parking for 4-5 cars. One under cover. Including hand and bathroom towels. Two large living rooms, both with coffee tables and televisions. Crockery, glasses and cutlery for 10. Full set of cooking pots and utensils. Very well equipped kitchen with stove and oven, microwave, slow cooker, electric frying pan and all you need for complete cooking menu. Smart TV with Netflix in central lounge. Televisions also in Main lounge, and two bedrooms. Stereo includes phone dock, CD and radio. 2 DVDs and large DVD selection available including for children. Complimentary fiction library provided. Includes magazines. Some games and soft toys provided. Lorne golf club at rear of property and one set of golf clubs provided. Our family of four recently had a mini break in Lorne. The house had everything that opens and shuts. Very comfortable beds. Wonderful views of the coast and quite bush at the back.Would highly recommend and will stay again.Thanks again. I couldn’t have asked for a more enjoyable time than I had at your house for vacation. The decorations are marvellous, you have an ideal home with plenty of rooms with comfortable beds facilities and fabulous view to seashore. We are fortunate to have such wonderful time. Thanks for everything. We were in Lorne to attend an event at the Lorne Country Club, so the location was perfect for us. Everything in the house was clean and in working order, we enjoyed the free wifi and netflix and found the beds to be comfortable. Plenty of room with a large kitchen and 2 living areas. We also enjoyed the scenery at both the front and rear of the property. Whilst the walk into town would be too far on a warm day, it is a great option if you don't mind being a bit further out. The property is exceptionally appointed and well presented. La Brise Marine is an well presented property with great amenties. The place has been recently renovated while maitinainng its existing charm. The place is great for families. A beautiful home, great view and awesome kitchen. We will be back!